Known all around the world for its unique taste and aroma OG Kush seeds produce some of the finest marijuana buds. With an aroma similar to sweet pine and sour lemon, it’s a firm favourite from the USA Medical Marijuana dispensaries to the Amsterdam Coffee-shops. Although a member of the Kush family, OG Kush was originally created using a clone from the infamous ‘Chemdawg’ and is one of the most awarded marijuana strains due to it’s potency. Many subsequent Marijuana seeds have used OG Kush genetics to enhance flowering times, taste and potency levels. OG Kush seeds are almost pure Indica, with only a 5% blend of Sativa genetics, producing plants that remain short, squat and bushy, growing between 25 cm and 100 cm tall. This makes it a perfect choice for both indoor growers and outdoor growers who may want discreet sized plants. OG Kush seeds grow and flower quickly, requiring just 55 days to achieve yields of approximately 450 grams per square meter of high quality marijuana buds. 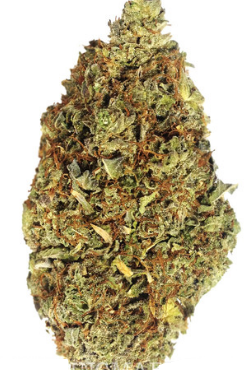 The mature buds are lime green in color, hard and dense, covered in resin with THC levels between 17-19%. The unique flavor and aromatic smoke produce an energizing, yet relaxing high, perfect for enjoying both day and night. OG Kush seeds are grown for both their recreational high, as well as their medical properties. A favorite in many of the medical marijuana dispensaries, known to provide relief from stress, anxiety and tension, as well as reducing nausea and the symptoms of depression. 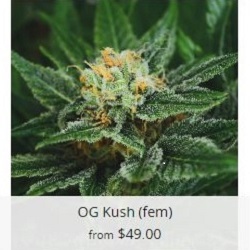 These premium quality OG Kush seeds are all feminized, meaning you will grow only female marijuana plants, wasting no time, energy or space on males. Sold in complete packs of 3, 5 and 10 feminized OG Kush seeds, all included in the I Love Growing Marijuana delivery and germination guarantee. Find Out How To Buy OG Kush Seeds.